Rainy days are made for reflecting. The earth feels cleaner, newer somehow; awash with possibilities despite all the dirt the water kicks up. 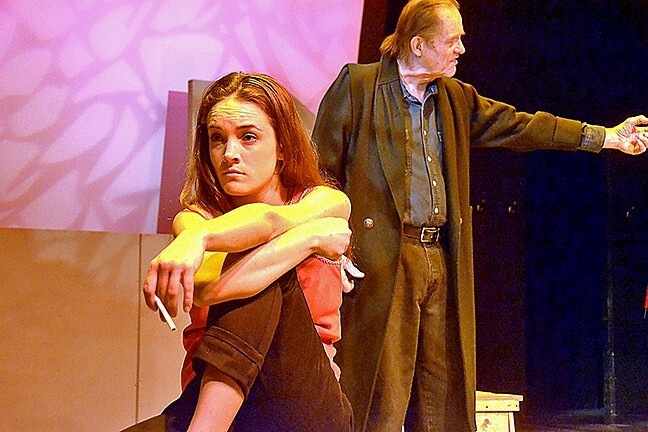 So in between rainfalls on a Saturday afternoon I made my way to the San Luis Obispo Little Theatre to enter a world where fish fall from the sky and the mistakes of the father carry on to the son in Andrew Bovell's When the Rain Stops Falling. TRY TO UNDERSTAND: Elizabeth Law (Rosh Wright) reads a letter from her son Gabriel Law (Gregory Gorrindo) who has found love with Gabrielle York (Erin Parsons) in the same part of Australia where his father was last seen. Set in England and Australia, the play follows the lives of a family across several generations; from a father forced to leave his young son's life because of his own poor actions, to that same man's grandson abandoning his own son for reasons he doesn't fully understand himself. "Every family has secrets," writes director Ron Clark in the program show notes. "Even the neighbors down the street with the white picket fence whose children return for every major holiday. Even my family ... even yours." Seen through that lens, When the Rain Stops Falling is highly relatable. It raises the questions: Can we learn from our ancestors' mistakes? Can we ever overcome the fate they've handed down to us? That having been said, the transgressions of the family members in this story and the attempts to right them will likely make audience members feel at least a smidgen better about their own families. The story starts in Alice Springs, Australia, in the year 2039. A fish falls from the sky and lands at the feet of Gabriel York (Gregg Wolff). It still smells of the sea. This is remarkable in a time where fish are nearly extinct. Fifty years earlier, his grandfather, Henry Law (Nathan Emmons), predicted that fish would fall from the sky heralding a great flood, which will end life on earth as we know it. While Gabriel York struggles with what to say when his estranged son, Andrew Price (Sergio Gavidia), whom he abandoned years ago, shows up for lunch. A minimalist set reconfigures to transport the audience from one era to the next. And while I suspect that maybe only one member of the cast was actually British, most everyone did a great job of not screwing up the accent the roles required. RIGHT PLACE, WRONG TIME: Joe Ryan (Michael Siebrass, right) reflects on how he first met his wife, a young Gabrielle York (Erin Parsons) when she survived a car crash. We are then transported back to London, England, in 1958 when Gabriel York's grandparents Henry Law (Emmons) and Elizabeth Law (Gwendolyn Gay) unexpectedly become pregnant with a son. Fast forward a few years later and Elizabeth is troubled as her husband's behavior becomes increasingly strange. Then one day when their son is about 5-years-old, policemen come to the door telling Elizabeth that her husband has touched a young boy inappropriately in a public bathroom. She can't believe it until she comes across a hidden stash of pornographic photos of children while cleaning the house. She gives Henry a choice, he can leave for Australia and never speak to her or their son again or she can turn the photos over to the authorities. Henry chooses the former, and their son, Gabriel Law (Gregory Gorrindo), grows up wondering why his father left. Elizabeth (played by Rosh Wright in later years) never tells. Her only giveaway is an increasing alcohol addiction. Gabriel Law goes on a quest to reconnect with his father's memory by traveling to Australia, where he meets the beautiful but very broken Gabrielle York (Erin Parsons), whom he is destined to leave in a tragic fashion. Their encounter leads to the birth of Gabriel York, who is raised by his mother and stepdad Joe Ryan (Michael Siebrass), who meets Gabrielle when he pulls her out of a car after a near-death accident. 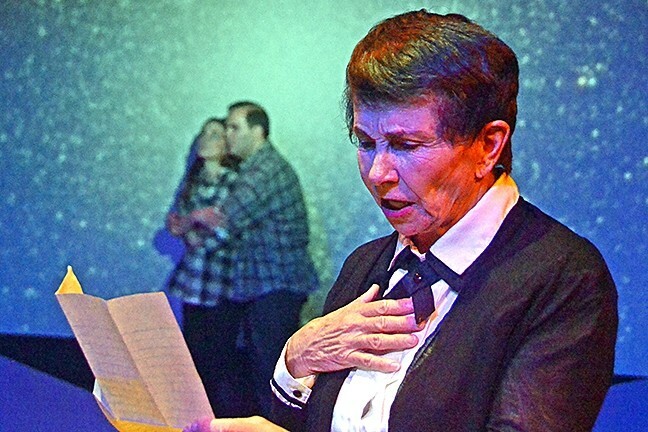 TEARS AND RAIN : 'When the Rain Stops Falling' will run through Nov.13 at the SLO Little Theatre. Tickets range from $15 to $32. Visit slolittletheatre.org for more information. It's a stark reminder of the circular nature of life. The actors take on challenging topics with compassion and nuance. Even while kicking out her husband for such an unthinkable act, Elizabeth Law admits that she still loves him, in spite of it all. Her son, Gabriel, later says the same thing about his mom when recounting how he found postcards from his dad that she had hidden. When the Rain Stops Falling is a reminder that parents and children are humans first, and deeply flawed ones at that. Ryah Cooley never wants the rain to stop falling in SLO at rcooley@newtimesslo.com.